Takeaway: Protecting offshore structures from corrosion and abrasion damage is an ongoing and costly challenge for operators. A polyurea coatings manufacturer discusses application of long-term protection for decks and other equipment, with rapid return-to-service capabilities. Both abrasive and corrosive, the marine environment is unforgiving of maritime structures such as offshore platforms and rigs, and ocean-going vessels – all of which are major investments for the companies operating them. All activities and structures in a marine environment are impacted by corrosion. 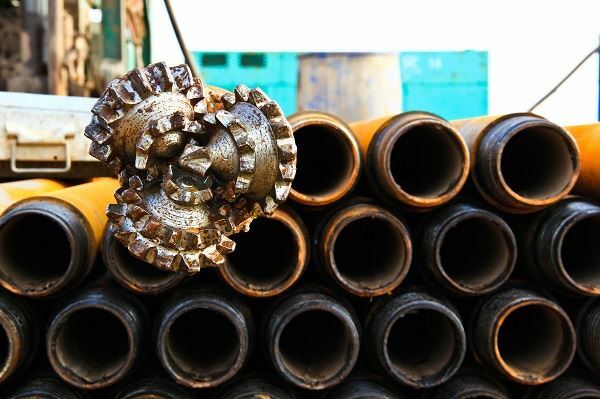 One way to minimize and mitigate the effect of some types of corrosion is through the use of flexible surface coatings that are resistant to chemical attack from petroleum products and salts. A corrosion barrier has to have durability and flexibility in addition to being impermeable to the wide range of agents that affect maritime structures. And, to enhance safety for personnel moving around an offshore structure or vessel, spray applied surface coatings with anti-slip properties provide safe decking and walkways. An oil rig deck where 14-meter lengths of drill pipe are laid out before being dragged across the deck and pulled up for drilling operations is prone to a large amount of abrasive damage. Most surface coatings are quickly abraded away, exposing the bare metal to corrosion. To prepare these work areas for coating treatment, the surface of the deck must be abrasive blasted to clean off any existing coatings and to profile the surface for optimal adhesion of the primer and protective coating. A zinc-rich primer is first applied to the prepared metal surface, over which a second spray primer is rapidly sprayed. The best primer choices for this type of application contain no volatile organic component (VOC) properties, and can be quickly spray applied. For maximum protection, a thick coat of polyurea is applied over the primed area to a nominal thickness of 3000 microns (3 mm). This final coating is chosen for its resistance to weather extremes, excellent flexibility and high-impact strength. Polyurea has the ability to cure rapidly, allowing the crew to walk on the surface in a matter of minutes, which means a facility can be back online sooner. A major consideration in applying any surface treatment is minimizing downtime. Spray coating enables quicker application and less disruption to operations. A rapid setting coating can cure in as little as 6 seconds. Unlike all other coatings, pure polyureas are not adversely affected by ambient moisture or temperature during application, which is an important consideration for offshore operations. Where pipes and other equipment penetrate the deck areas of offshore structures, it is important that liquids do not run down the pipes to the ocean below. Most offshore rigs cover these penetrations with a butyl rubber 'boot' that is taped to the pipe and the deck. However, the rubber of the boot and the adhesive can be degraded by UV light and salt exposure in a matter of months. 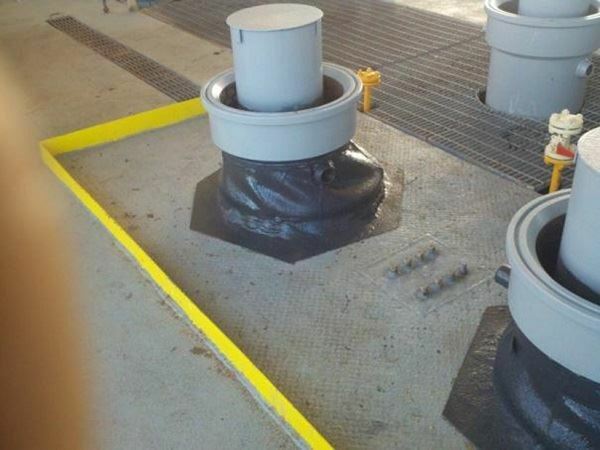 To extend the operational life of the deck penetration boots, the butyl rubber and the adjacent steel surfaces are usually scuffed and cleaned prior to applying an appropriate primer. It is important that all loose coatings, oils, and dirt are thoroughly removed before applying the new flexible membrane. Similarly, the surrounding equipment, piping and deck surfaces must be masked off to protect against overspray. Applying a polyurea coating to a thickness of 2000 microns or greater, and extending 50 mm up the pipe and 100 mm onto the deck, creates a liquid tight, weather resistant, flexible interface on all deck penetrations with the long-term durability required by the marine industry. Pure polyureas are formed when a liquid isocyanate is mixed under high pressure with an amine-driven resin solution. Isocyanates are reactive because the double covalent bond attaching the carbon atom to nitrogen and oxygen atoms is easily broken to form single bonds in the more stable tetrahedral configuration around the carbon atom. Some types of polyureas come as a two-part solution that is mixed under high temperature and pressure (3000 psi at 65 ºC) in a specially designed spray apparatus. When applied, the excellent chemical cross-linking produces a dense but flexible surface. The high density makes the coating almost impervious to abrasion, water and chemicals. Pure polyurea coatings cure rapidly to form a solid surface that can be walked on without damage in less than one minute. Another advantage is the ability for polyurea to be sprayed up to 6000 microns thick (and greater) on a sloping or vertical surface without sagging or running. The surface of a thick polyurea coating is easy to maintain, clean and recoat if necessary. While epoxies and paints form a solid, rigid shell, the flexibility of pure polyurea coatings allows them to move with the expansion and contraction of the underlying structure as temperatures change. Written by Denis Baker, Eng.